The national stadium of the England football team, Wembley Stadium was re-opened in 2007 after a full rebuild to the tune of £757 million. The second largest stadium in Europe, Wembley took over three years to build and is located on the site of the previous 1923 Wembley Stadium, often referred to as 'The Twin Towers' or Empire Stadium, which was demolished in 2003. The much-loved old stadium played host to some incredible games during its 70-year life, starting with the infamous 'White Horse' FA Cup Final in 1923 when over 240,000 spectators crammed their way in to watch Bolton Wanderers beat West Ham United 2-0. The famous twin towers have been replaced with the new stadium's trademark soaring 134m-high arch - the longest single span roof structure in the world - which is visible from all over London. Early teething problems with the standard of the pitch meant the turf had to be relayed 10 times in the first three years. As well as being the national home of the England football team and hosting the latter stages of various domestic club football competitions (such as the FA Cup Cup, Community Shield and Championship/League play-offs), Wembley Stadium also hosts the Rugby League Challenge Cup final and the annual NFL International Series game. In 2011, Wembley held the UEFA Champions League Final between Barcelona and Manchester United. The Stadium also hosts the 2013 final. 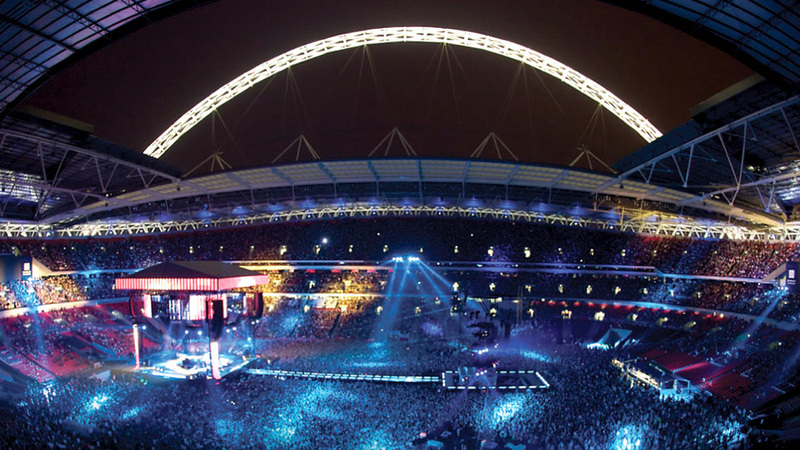 Outside the sporting world, Wembley is also a large venue for top music acts, and has played host to the likes of Take That, Muse, Oasis, U2 and Coldplay. Wembley Stadium gyms, sporting activities, health & beauty and fitness. What are the best dining options near Wembley Stadium London? The best pubs near London Wembley Stadium. Wembley Stadium clubs, bars, cabaret nights, casinos and interesting nightlife. Where to have your meeting, conference, exhibition, private dining or training course near Wembley Stadium. From cheap budget accommodation to luxury 5 star suites see our deals for Wembley Stadium hotels, including Holiday Inn London-Wembley from 90% off.